Helping kids learn about their environment is important, whether that environment be built or natural. One excellent way to do this is via books, so I was thrilled to find these two new resources recently. Home is a children’s picture book by Carson Ellis and published by Walker Books, 2015. From the moment I first picked it up I was impressed with the quality of the physical product, the illustrations and the text. I loved everything about this book. Home as a concept is something all kids will relate to, even though those homes may seem very different. Ellis introduces ups to many different homes and invites us to muse over them. There are charming and funny visual links - a French lady outside her home is tooting her horn toward the opposite page where at an Atlantian, underwater, is tooting a conch shell right back at her. Kids will recognise some homes from literature, and some perhaps from their life experiences. The simplicity of the text means that emergent readers will soon be able to read it aloud to someone younger. The complexity of the illustrations means that children will want to return to the book and pore over it with others. There’s lots to think about and compare. For instance, on one page we have “This is the home of a Japanese businessman.”, with a gentleman standing in front of a starkly modern grey structure, inset with a bright red window showing one plant and some patterned material. Opposite is “This is the home of a Norse god.”, with a helmeted gentleman (Heimdallr?) standing in front of an ornate and colourful structure that could be the gate outside Valhalla. We see some very exotic homes: a Moonian’s home has a wonderful view of Earth through the round window and a most intriguing potted life form; there’s another home we’re invited to identify which seems to be on a planet where you need an artificial atmosphere and greatly adapted environment. I loved the page showing the artist’s own home - here we can try to identify snippets from all the other illustrations and watch her at work. Where’s the Elephant? is a children’s picture book by Barroux, published by Egmont, 2015. Where's the elephant? Where's the parrot? Where's the snake?...And where are the trees? What starts as a game of jungle hide-and-seek quickly turns into something more significant in this charming, unique book by award-winning illustrator, Barroux. It would have been easy to make the book a depressing one, but the ending is optimistic and liberating. Kids will love the puzzle aspect of simply locating the animals, but I hope they’ll absorb the underlying message and ponder its implications. 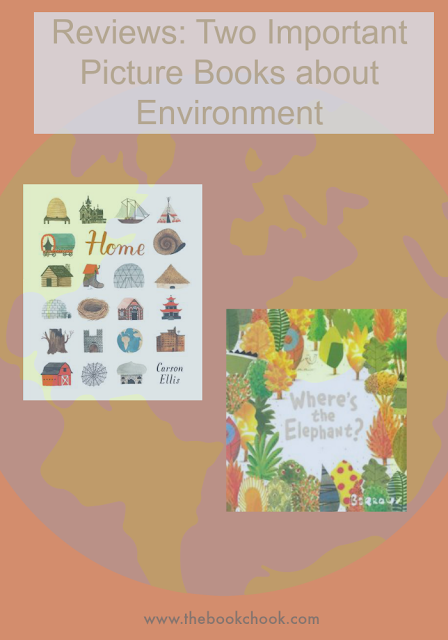 These two children’s picture books are quite different, and address different aspects of the environment. Both are not only entertaining but will also engage children's interest. I hope you’ll consider them for your home, school or library. If you’re interested in discovering more children’s books, check out Reviews: A Monstrous Mouthful of Picture Books, Beautiful Books for Babies, Recent Picture Books for Kids with an Australian Theme, Recent Children’s Picture Books about Animals, A Swag of Australian-themed Picture Books, Recent Children’s Picture Books about Birds, Reviews: Three New Picture Books about Dinosaurs, Recent Children’s Picture Books about Animals or simply click Reviews in the right side-bar. You might also like Activities for Children's Book Week 2015 and Children's Book Week 2015 - Challenges for Kids.